Solly March felt Brighton & Hove Albion would have comfortably beaten Watford on another day had Ben Foster not been in outstanding form. 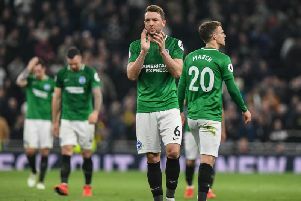 The Seagulls were left frustrated after a 0-0 draw at the Amex on Saturday increased their winless run in the Premier League to five games. Foster denied Jurgen Locadia twice, Shane Duffy and Florin Andone during the match, while Watford did not have a shot on target. March said: "We had chances to win the game but their keeper has pulled off three or four good saves and kept them in the game. "We're obviously disappointed. We felt we had enough chances. Two of them were good headers where the keeper has pulled off great saves. "Florin was through one-on-one so maybe on another day he takes that but we got in the positions and on another day we win 2-0 or 3-0 if the keeper has not had a day like he has. "We've got to look at it positively and if we play like that every week, we'll win games more often than we draw." March was also pleased with the clean sheet after Albion conceded four times in the second half of their 4-2 defeat at Fulham last week. He said: "After the second half at Fulham, we wanted to show we can defend which we know we can. One bad half isn't going to define us as we do defend well and we showed that again today. "I don't think Maty has made a save, so obviously we defended well and restricted them to nothing."